We’d love your help. Let us know what’s wrong with this preview of The Incredible Shrinking Bully by Mona Schmitt. Bart used to enjoy school, but that was before Frank the Tank began bullying him. Every time Frank bullies someone, he gets bigger. Will Bart find the courage to stop Frank, before it's too late? This is a picture book geared toward younger kids, in hopes of sending a positive message and opening a dialogue between kids and parents, educators, grandparents, etc. about bull Bart used to enjoy school, but that was before Frank the Tank began bullying him. Every time Frank bullies someone, he gets bigger. Will Bart find the courage to stop Frank, before it's too late? 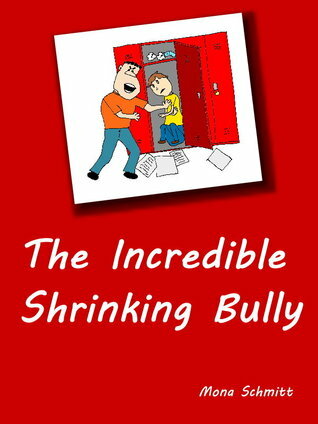 To ask other readers questions about The Incredible Shrinking Bully, please sign up. Children have so much to deal with in school that a bully should not be one of them. I hate the idea that there are bully's in school, but everyone has to learn to how to be who they really are. I think that everyone gets bullied at some point in their life and most people even act as the bully at some point. You may not even realize that it has happened until after it is over. This story gives you a way to talk to your children about how bullying occurs and how you can handle it. Bullying makes Children have so much to deal with in school that a bully should not be one of them. I hate the idea that there are bully's in school, but everyone has to learn to how to be who they really are. I think that everyone gets bullied at some point in their life and most people even act as the bully at some point. You may not even realize that it has happened until after it is over. This story gives you a way to talk to your children about how bullying occurs and how you can handle it. I loved the pictures! My favorite picture in this book has to be when Frank snot rockets on some kids locker. It is totally gross but so funny! This story is age appropriate and can be used in most grades K-9th. If you wanted to adapt it to use it in higher grades you could, just use different activities to enhance the point of the book. If I were to use it in a classroom I would read the book, discuss bullying, and finally have them create their own book about a time when they were bullied. Peo I loved the pictures! My favorite picture in this book has to be when Frank snot rockets on some kids locker. It is totally gross but so funny! This story is age appropriate and can be used in most grades K-9th. If you wanted to adapt it to use it in higher grades you could, just use different activities to enhance the point of the book. This story was really well done. It was very straightforward and honest. There was some rhyming, with character names, but it wasn't constant like it can sometimes be in other children's books. I also really enjoyed the additional questions at the end of the story. I'll be working on a blog post later on to explore the issue of bullying a little further.